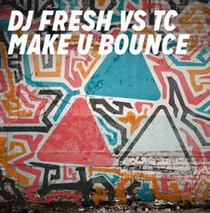 DJ Fresh is back with his latest track and is ready to 'Make U Bounce’. Fresh's love of working with producers that inspire him and adopting the 'VS' approach to production has so far seen him teaming up with Stateside producer Diplo and Moombahton's Jay Fay, on the hit records 'Earthquake' & 'Dibby Dibby Sound'. 'Make U Bounce' is no exception. Aligning himself with one of the D&B scene's finest, TC, DJ Fresh explores yet another genre of bass music to huge effect. 'Make U Bounce' is as memorable as it is energetic and with the Zane Lowe's 'Hottest Record In The World' title under its belt... it is off to an pretty good start. It’s out 22 June on Ministry of Sound Recordings, check it out below.